Sister singers . . ..
"They are gold and diamond from beginning to end, a supreme work, their song is like honey, their every breath and movement is a divine conduct." So says Petros Alahaydoyan, an American-Armenian arts specialist in admiration for singers and sisters Anush and Inga Arshakyans. The art critic is not the only one who has been smitten by the sisters' talent. Their performances are typically met with thunderous applause from fans who show their appreciation through gifts and praise. The young women (Anush is 24 and Inga is 22) modestly receive the accolades for their talent at bringing the pure music of Komitas and Armenian melancholic psalms to a new generation. The deep, gentle sounds of the sisters are an embrace of melody, from two voices united by a common blood. They started singing when they were children, but also became proficient in violin and piano. "We loved singing, and each time working in the kitchen we would make up and harmonize improvisations and fall into oblivion. Then we'd become aware that our mother was calling us, and we would continue washing the plates," says Anush. It never even occurred to them that something that turned housework into pleasure and then to the admiration of family gatherings, would finally put them on the public stage and gain the approval of professional musicians. "I was glad and astonished when in this age of bad taste everywhere, I heard Anush's and Inga's performance. They sing Komitas so delicately and correctly and when singing psalms they looked like real saints," says composer Eduard Mirzoyan. 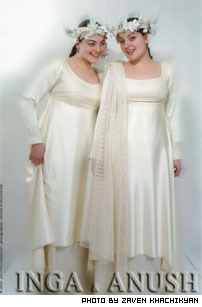 The sisters were first noticed outside the family circle in 1999, when they were discovered by popular singer Shushan Petrossyan. "Shushan told us that by all means we have to go to the State Theatre of Song, which is a very important school for singers' formation and self-confidence," says Inga. The girls took the veteran performer's advice, entered the State Theatre of Song in 2000, and held their first concert in the theatre hall in 2002. "The hall of the State Theatre of Song is rather uncomfortable, since no matter how you stand there still there is audience behind you," the sisters recall. "So during one of the rehearsals we asked Theatre director Artur Grigoryan what to do not to stand with our backs to the audience." Grigoryan answered: "Why are you so sure there will be people sitting back there?" During their concert in May all sides of the hall were full. The sounds full of difficult musical nuances overfilled the hall, attracting people from off the street to the soulful presentation of girls who were not yet known. Soon the sisters were planning tours that would take them to Tehran and Los Angeles. In 2002 Anush and Inga released "We Are These Mountains", a CD of 11 songs that became popular and produced sales inside Armenia and abroad. All the girls received for their effort was one copy of the CD. When the girls asked the producer when they'd be getting payment for their work, they were told that income from the sales had been given to Pyunik Union for the Disabled. The sisters say they would only be happy to help the disabled with their art, however the donation seemed questionable since neither they nor Pyunik knew anything about it. And on this sad note, their cooperation with Yerevan's State Theatre of Song was over. After leaving the theatre Inga and Anush haven't had a concert of their own. They are looking for a sponsor who can underwrite production costs. "Inga and Anush are delicate creatures and it will be extremely hard for them to carve their way in a sphere were there are neither moral nor legal rules, but due to their talent they will take a permanent place in the dome of art," says music specialist Marine Mirzoyan. They don't lack for appearances, however, as the sisters are popular performers at State receptions. They have performed at such functions for Russian President Vladimir Putin, for conductor Yuri Bashmet and for violinist/conductor Vladimir Spivakov. They have also been invited to Paris to participate in celebrations of singer/actor Charles Aznavour's 80th birthday in May.